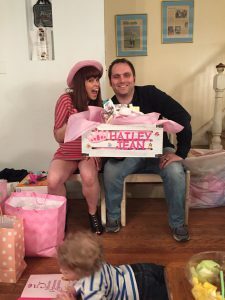 On Sunday, my family threw us a baby shower for Hailey. Since Hailey is baby number 2, this was mostly a way to celebrate our new addition with family and friends. We have a lot of items that will be passed down from T, but we were also able to stock up on some much needed girl clothes! In order to help T be a part of the celebration, we made two projects in preparation for the shower. The first was a candy-filled umbrella favor and the second were marshmallow pops. These were a lot of fun to make and definitely helped T start to take on his role as a big helper. 1. First we decorated the cone shaped cups with Tyler's doodles and the words "Baby Hailey 4/10/16". 2. Next, we cut out strips of tulle to wrap our cones in. The width of our tulle was 6 inches so we needed two pieces for each come to make sure the jelly beans didn't fall out. We also cut strips of ribbon which we used to tie the tulle together. 3. I hot glued the candy sticks into the center of the cone to be the umbrella handle. 4. Tyler filled the umbrellas with jelly beans. 5. I wrapped each jelly bean filled cone with tulle. This was done by placing an x of tulle on the table, placing the point of the cone in the center, and then wrapping the cone with the tulle. I tied it off with a piece of pink ribbon. I think they came out pretty cute. We obviously chose pink since we were having a girl shower, but you can pick any color you like depending on whether or not you know the gender. Now, on to the marshmallow pops. T really enjoyed making these. Again, we used pink candy melts for our pops, but they would be just as cute with any other color. 1. First we laid out a bunch of marshmallows on a plate and Tyler inserted the paper straws. He pretty much just jammed them in there. 2. I melted the candy melts in the microwave. First for one minute and then for 30 second intervals stirring in between until it was all melted. 3. Together we dipped the marshmallows in the melted candy and sprinkled them with sprinkles. At first T was shoving the marshmallows into the sprinkles, but we found that sprinkling them on top was much more efficient and less messy. 4. We stuck the straws into Styrofoam so the candy could dry. That's the finished product. They may not be perfect, but they were made with love. Plus we had a lot of fun making them. Even dad helped out! We had so much fun at the shower. It was great hanging out with friends and family. Tyler recited the end rant from Willy Wonka several times and we all enjoyed good food and good company. Here are some shots from the party. 3 weeks left til D-day!! We are so excited!! Have a happy weekend everyone!